It was the mid-eighties and the Virginia native, who'd recently relocated to New Jersey, was playing a showcase club in Manhattan called Trax. A busload of supporters had come to cheer him on. A few A&R guys caught the show, in which John wowed everyone in the house. By the next morning he found himself on the brink of an intense major-label bidding war that soon attracted the interest of the press as well as the industry. It didn't hurt that Bruce Springsteen, was, and still is, a fan and would sometimes surprise John by hopping onstage during his weekly gig at the Stone Pony in Asbury Park, NJ. Though lots of comparisons to the Boss were made, especially after John signed a two-album deal with CBS/Sony, John's approach was always more Memphis than Asbury Park. He had a lot of country in him, plus elements of soul music, folk, and rockabilly. There was boyish swagger in his voice, but it was the vulnerability lurking behind it that could really get to you. John has an easy-going rapport with his very loyal nation wide audience, and a self-deprecating sense of humor that has only sharpened over the years. 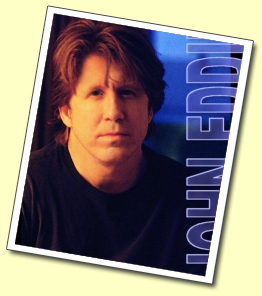 John Eddie is one of Asbury Park's most famous adopted "working class guy" musician's and songwriter's. Besides performing with Springsteen, John has performed with The Big Man, La Bamba, Bobby Bandiera, Southside Johnny, and is currently on tour with Melissa Etheridge.